Warning: This post has very little to do with food! This was the card I made for Cornelius this year. Our profiles in cameos. Cornelius is a bit shy about it tho…he doesn’t want anyone looking at his adam’s apple – plus when I took his picture, he made a funny pursed face cuz he doesn’t like his picture taken (heehee). The card he made me is equally beautiful. For our wedding last June, we gave out 2 kinds of favours. One was a chinese take out container tied with a pretty ribbon (either chocolate brown, teal or cream) and filled with chocolate hand-dipped chinese fortune cookies made a few days before the wedding by us. The other favour was a cd of “romantic” (read: meaningful to us) songs in very pretty packaging done by yours truely. I wish I could post all the songs somewhere online so I could share the love, but I don’t have that much online space to give away. Here’s the track listing (plus notes!) so you can try to find them on your own…legally, of course! 1. Beginnings – Astrud Gilberto (C really wanted to use the original Chicago version, but I fought him hard as there was already enough ’70’s am radio songs on this mix). 3. Since I met you baby – Ivory Joe Hunter (In the past, C had used another Ivory Joe Hunter song to woo me. It obviously worked). 13. Little Things – Bobby Goldsboro (this was on the Drugstore Cowboy soundtrack & we searched long and hard for this version since all we had was a tape cassette version). Wow–definitely the most adventurous wedding CD I’ve ever seen! Someone just introduced me to Gorky’s Zygotic Mynci this last weekend. Am still absorbing. If you ever do want to host mp3s, you can get an extremely cheap account with EZArchive (ezarchive.com). Just $6/year (not sure how that converts to Canadian $$$, but still cheap) for 100MB of space. “You you you you you” holds a place as one of my favorite songs ever (how corny that sounds). I never payed much attention to it on the album until I saw “Pieces of April,” and then I played it non-stop. Now I just hum along and try to convince the French of the glory that is Stephen Merritt. Oh, what gorgeous music! Ain’t love grand? Love the chocolate dipped fortune cookies! What a neat idea! I have often thought about handing out made CD’s at my non-exsistent wedding that feels like it will never happen. However our songs would have to be a bunch of sports songs because that it what we are into, it might not make the same impression. To each his own I guess. that is a really cute card! do you have to use a computer program to do that? and great ideas with the wedding favors by the way. the dipped fortune cookies look so pretty! Thanks Amy! 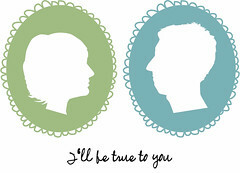 We definitely wanted a wedding cd that reflected us but wouldn’t scare away the older folks. And all the comments we received about it were totally positive. Yup, it’s a great song, Gina Louise! I can’t believe the French haven’t fallen for Stephen Merritt…somehow, he seems tailor-made for French pallettes (or maybe that was Jerry Lewis). Hmmmm. Heather, make cds anyway & hand them out to friends. It’s the funnest!! I used Adobe’s Illustrator to trace a photograph. I was originally going to paint it, but I was running out of time.